When you take a world-renowned videogame designer and put him in his garden at weekends, this is the result. Space traveller Captain Olimar crashlands on a supersized planet shrouded in poisonous oxygen, things look pretty hopeless - until he meets the Pikmin. These plant-animal hybrids carry out Olimar's every command, building bridges, swarming giant wildlife, carrying items, and more. 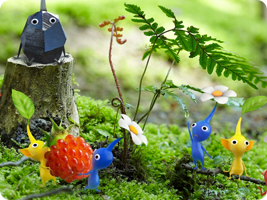 As Nintendo's first shot at a real-time strategy game, Pikmin has been a quickfire hit for its easy to understand controls.